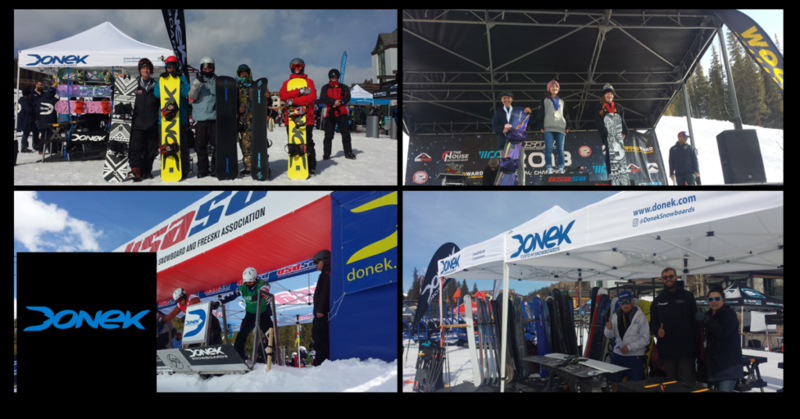 Donek Snowboards is excited to announce our biggest demo of the year March 29 – April 7 at Copper Mountain for USASA Nationals. Everyone is welcome to come say hello to president Sean Martin and meet the Donek build team. Free demos are available with a valid driver’s license and a credit card. Riders under 18 years of age will need a legal guardian to sign their waiver. Donek’s B1 World Cup level boardercross snowboard will be on site and you can have a chat with US Boardercross Team rider Senna Leith about his experiences on the World Cup tour. Snowboard with Ryan Knapton and Giri Watts sessions are on a first come first serve to demo boards and ride with Ryan and Giri. Follow Ryan for the latest updates on sessions or have a look at this YouTube Video Try alpine snowboarding! Yes, we will have alpine snowboard demos available from March 29 to April 1. Board and boots are available for anyone to try, an intermediate snowboarding level is required to demo. Donek-a-saurus will be handing out candy at prize giving March 29 – April 3 outside the Donek tent. Watch the world’s largest snowboard competition, USASA Nationals has over 1400 competitors from ages 6 – 66 competing in all disciplines. There’s excitement every day along with a great vendor’s village with many companies who support the USASA and snowboarding in the US. Even if you don’t snowboard, there’s lots to see and do. Find out more about Copper Mountain If you’re in the Denver or Summit County area come out for a visit and Demo a Donek! This entry was posted in snowboarding. Bookmark the permalink.